through Combined Competitive Exam. Candidates who are willing to apply for this BPSSC Police Sub Inspector Jobs may go through the official website www.BPSSC.bih.nic.in. Applications for this recruitment are available from 24/October/2017 to 30/November/2017. Selection of candidates for BPSSC Police Sub Inspector Jobs will be based on Preliminary Examination, Physical Measurement Test and Physical Efficiency Test, Mains Examination. 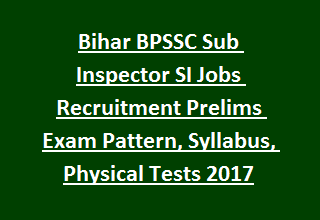 Full details regarding preliminary test, Mains Exam pattern & Syllabus details, physical measurements tests and other details of Bihar BPSSC Police Services Sub Inspector SI Recruitment Common Entrance Exam Notification are given below. Total available vacancies in Bihar Police Services recruitment are 1717 posts. Post Name: Police Sub Inspector (Police Services): 1717 posts. Candidates Selection for this Bihar Police department Sub Inspector Jobs will be based on following three stages. Preliminary Exam consists of 100 Objective type multiple choice questions. The exam duration is 2hrs. Total marks are 200. Minimum qualifying marks in BPSSC Prelims Exam are 60 marks (30%). Syllabus for BPSSC Prelims exam will be given from the General knowledge & Current affairs. Based on merit in Preliminary Exam, candidates will be called for Main Examination. Candidates who have cleared prelims Exam are only called for the Physical Measurement Tests. For Female Candidates &: 5 feet 2 inches. Candidates who cleared Physical Measurement Test and Physical Efficiency Test will have to attend Main Examination.